I enjoyed this one quite a bit. I have to say it's one if not my favorite from this series and big improvement from the first three. Drake and Emily were quite a refreshing pair in the Inferno Club gang. Emily Harper is the first heroine in this series I actually liked and enjoyed. Pigs must be flying. :P I found her endless devotion, love and faith in Drake endearing and her bravery and strength and resourcefulness admirable and charming. She's described as everything pure and innocent but has a resilient spirit to back it up. I love that she was a perfect mix of shy innocence and courage and resilience. A heroine worthy of one of the brave Order agents and no shrewish behavior to be seen anywhere. Yay! Go Emily! I'm usually not a big fan of childhood sweethearts falling in love or reuniting, but here I was charmed and smitten by Drake and Emily's long standing friendship and secrete longing history. They were each other's saviors and it was sweet and touching. And the whole 'forbidden to touch the woodsman's daughter' history made their dynamic and secrete devotion to each other that much more enthralling and addictive. They had the whole forbidden love and star crossed lovers kind of thing going which worked. It was believable and bittersweet and I wanted them to find their HEA just as badly as both of them did. As far as the villains go I have to say Foley is losing her touch in that area. I didn't really find the evil corrupted Promeathians as menacing and Satanic as the author tried to paint them. I don't know it's something I guess I struggled with since the beginning of this series and made my interest slowly wane through each book. The Devil worshiping group of villains just aren't doing anything for me and I found my eyes glazing over and skimming over the parts where the evil cult would sit around discussing their scheming plots to userp each other. Meh. I will say I was a little irked that Foley decided to waste the epilogue of this story as a set up for the next book instead of giving us a sneak peek into Drake and Emily's HEA ending. And the fact that it was used for Beau and Busy Body Nosy Carissa set up was even more annoying. What is it with this series and tiresome heroines? I'm a big fan of epilogues and I get a thrill when authors use it to show readers how the couple are faring after their happy ending. It annoys me when it's wasted on secondary characters that have nothing to do with the initial story just told. -__- Ever heard of a sneak peek? And the title of this is a little misleading because the hero in this isn't a Prince, literal or otherwise, so I'm wondering why GF chose that title? 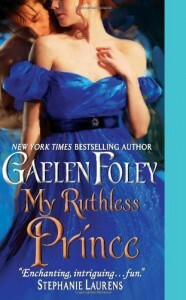 Anyways, as much as I love Gaelen Foley I think my read ends here with this series. While this isn't bad I do think her older work is much stronger. To be honest the only thing that compelled me to read this was because I wasn't satisfied with how things were left off with Drake and Emily's introduction in the last book intrigued me. Their back story made me pick this up plus I had this book on my buy list for over a year so I couldn't quit it. I personally think this series has run it's course and the remaining 'agents' aren't all that interesting. And having a nosy snoop gossipmonger for a heroine just isn't inspiring me to pick up the next book. No thanks.